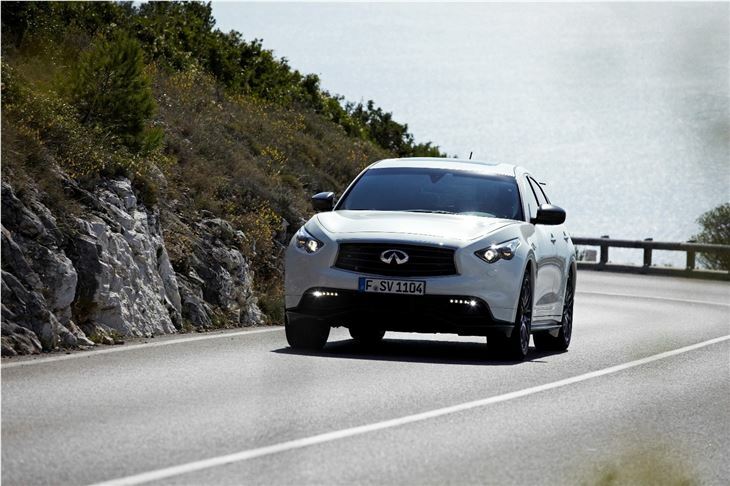 When was the last time you saw an Infiniti on the road? 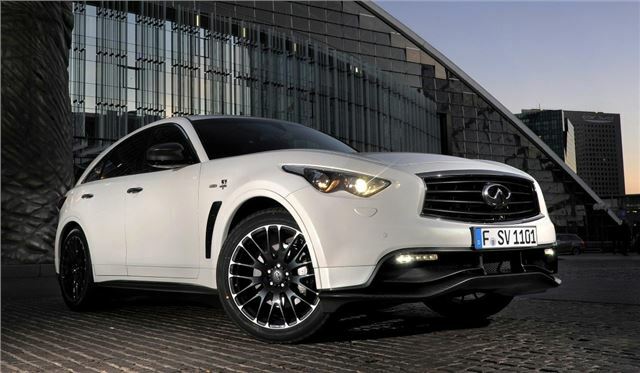 Have you ever seen an Infiniti on the road? No? You're not alone - although the Japanese luxury brand has been on sale in the UK since 2009, its mix of performance (and low economy) petrol engines, 'distinctively' styled models and high prices has hardly captured the imagination of buyers. So you'd think its latest model might address at least one or two of those concerns. You'd be wrong. 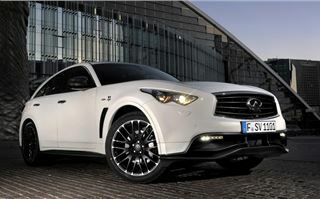 Instead, what's on offer is the £100,000 FX Vettel Edition - the most ludicrous Infiniti yet. 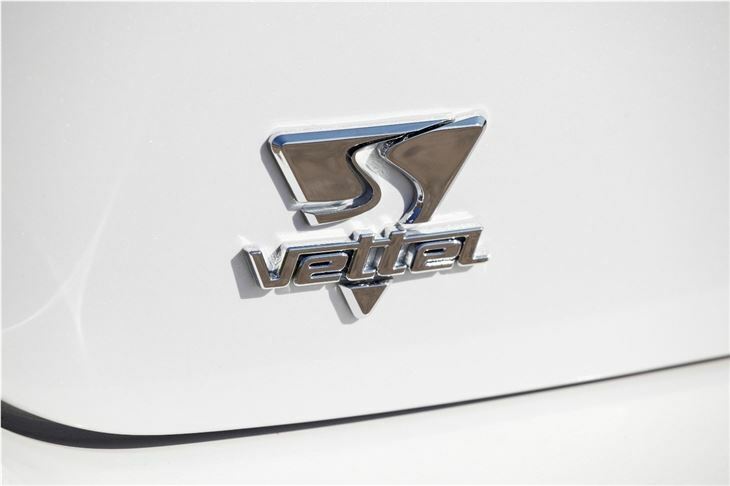 It's been created in collaboration with the Red Bull Racing Formula 1 star Sebastien Vettel. Quite how much development work he's personally been involved with is open to debate, but he is said to drive one himself as part of the sponsorship deal that Infiniti has with Red Bull Racing. In case you do spot one on the road, after mouthing 'what the hell is that? 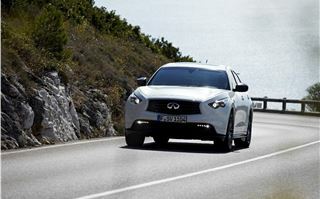 ', you'll notice that there's slightly different styling to the FX50S on which it's based, specifically a carbon-fibre front spilitter, rear diffuser, spoiler and mirror caps. 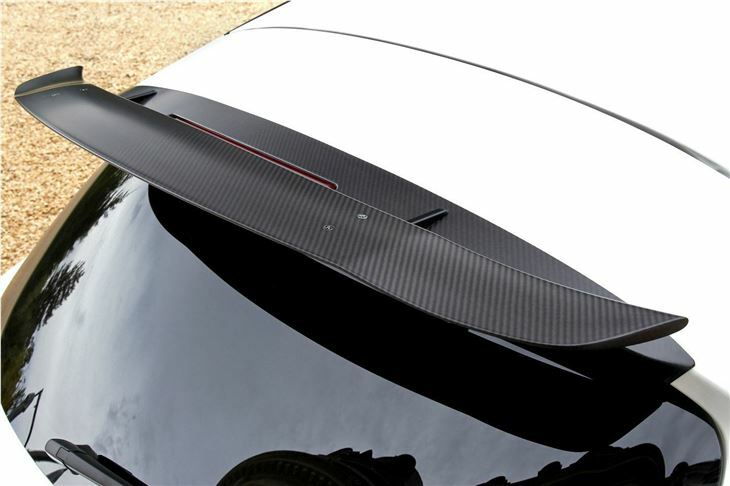 It's proper, 'hand crafted' carbon-fibre too and fittingly more akin to what F1 cars are made from rather than the flimsy artificial stuff you might see adorning boy-racer dashboards and Halfords shelves. The bespoke 21-inch alloy wheels are another tell-tale sign. The clue for those inside the car is the poor ride quality that they give. 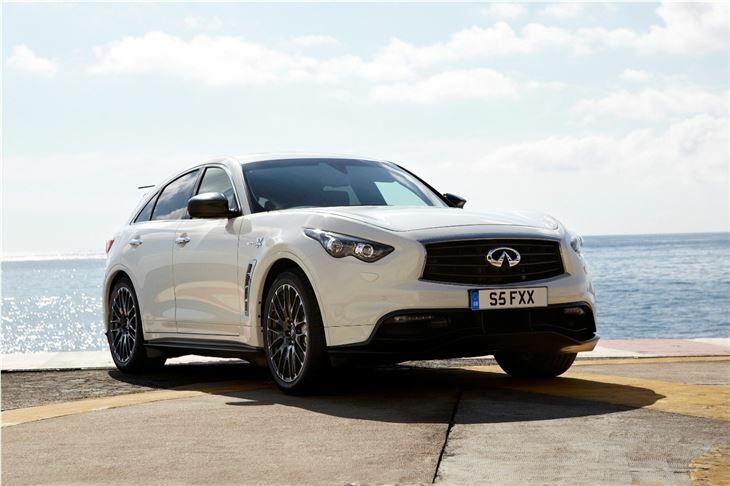 The cabin has been restyled, too, with Infiniti's signature purple used on the Alcantara seat faces and yet more carbon-fibre on the centre-stack, which is installed by hand. Performance has been improved over the standard FX50, but don't get any ideas about it matching what Vettel drives every other Sunday. There's an additional 30PS (taking it from 390PS to 420PS) and a re-worked exhaust for a deeper, more purposeful growl. Peak power from the 5.0-litre V8 is up to 420PS and torque is up by 20Nm to 520Nm. 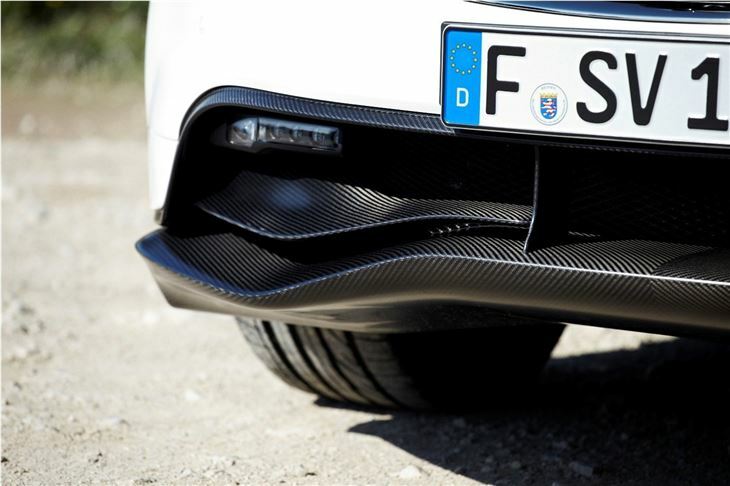 The top speed remains limited to 155mph and 0-62mph can be achieved in 5.6 seconds, which is pretty good for a car that weighs more than two tonnes. If you've already shelled out £100,000+ for a car that's performance-focussed, fuel consumption is likely to be a side issue. Officially it's 21.6mpg on the combined cycle, but it's likely to be a bit less than that - especially if it's being pushed. Emissions of 307g/km CO2 place it firmly in VED band M. That means £1000 in the first year and £475 after that. Ouch. And that price? £100,800 is £42,520 more than the FX50S on which the Vettel Edition is based. It's a huge premium on the standard model, so you might expect a much more purposeful and driver focussed car – but in practice it feels almost identical to the regular FX50. That’s not really a bad thing – it’s composed for such a large vehicle, with little in the way of body roll. There’s also accurate steering and a good turn of pace, but it feels tall and weighty through corners. The engine sound is noticeably more purposeful than the standard FX50, but the extra 30PS doesn’t make a massive difference in practice. It’s comfortable, though, and there is room for adults in the back, along with a fairly good boot. However, that’s the case with a normal FX and you’d expect more for £42,250 – but that’s not the end of the story. The premium over a regular FX model gets you more than an exclusive car, you also benefit from some very unique extras. 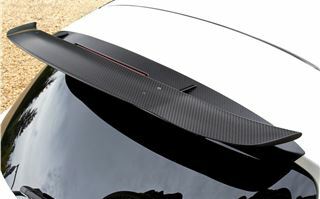 First of all, buyers receive a carbon-fibre backed iPad on placing their order. It comes pre-loaded with software allowing the buyer to track the production process across the world until the car is delivered. 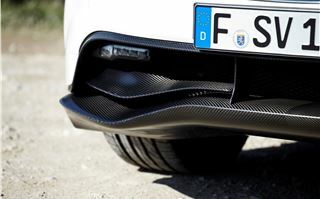 More importantly, buyers will get invited to a host of special events, a recent example of which involved Vettel himself, demonstrating the capability of the FX Vettel Edition on track to an invited audience. There are also rides in multi-seater F1 cars on offer, training sessions with F1 stars and sessions in an F1 simulator. 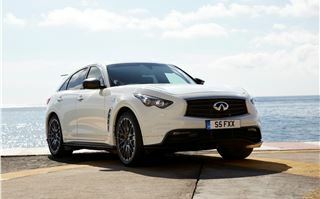 There will also be more typical track days without the F1 star present and buyers will be treated as VIPs every time they enter an Infiniti showroom. The events don’t stop when the car is delivered, so buyers can expect to enjoy special treatment as long as they own the FX Vettel Edition. 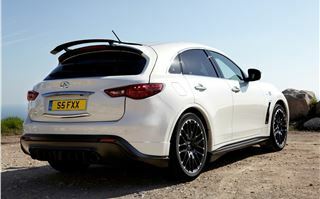 It’s difficult to recommend the FX50 Vettel Edition as a car alone – those who want a big, mean V8-powered SUV have plenty of choice, whether in the form of a standard FX50 or a Porsche Cayenne and the cosmetic and performance extras don’t really add up to the £42,520 premium.